Russia is considering a plan to temporarily disconnect from the Internet as a way to gauge how the country's cyberdefenses would fare in the face of foreign aggression, according to Russian media. The bill would require Internet providers to make sure they can operate if foreign countries attempt to isolate the Runet, or Russian Internet. It was introduced after the White House published its 2018 National Security Strategy, which attributed cyberattacks on the United States to Russia, China, Iran and North Korea. As part of the experiment, communications oversight agency Roskomnadzor would examine whether data transmitted between Russia's users can remain in the country without being rerouted to servers abroad, where it could be subjected to interception. Of course, this shouldn't come as a huge surprise. Over the past few years, Russia has made a bunch of fairly significant moves leading up to this. In 2014, it passed a new law demanding that user data remain on Russian soil, and threatened multiple US companies for failing to do so. Also, almost exactly two years ago, a top Putin adviser hinted at a similar plan to experiment with disconnecting the country from the internet to see how resilient a domestic Russian internet would be. The process by which it would do so remains challenging. “In short, Russia would need to do two things: Ensure that the content Russians seek to access is actually located somewhere in the country, and ensure that routing and exchanges could all occur domestically,” says Nicole Starosielski a professor at New York University and author of The Undersea Network. There's a lot more in the Wired piece, but it certainly suggests that Russia might find it more difficult than it expects -- but I guess that's the reason why the country is considering this as a "test," rather than finding out how well it works out of necessity at some later date. To some extent, this sounds like a nation-state level experiment along the lines of Kashmir Hill's recently journalistic experiment in cutting out the various tech giants, which alone proved to be significantly harder than most people would have expected. There is, of course, a larger point here. The value and importance of the internet is built quite heavily into the fact that it is a borderless, global network that allows information sharing and communication nearly anywhere. There have, obviously, been some limited challenges to that (China being the most notable), but it still remains mostly true. There have been increasing fears of a "fragmenting" internet, and Russia toying with this "test" only drives home how real that fragmentation may become in the very near future. Having had our own run-ins with Google's opaque (and often hypocritical) decision-making process at times, it's not surprising (though unfortunate) to hear of yet another case. The folks over at Disconnect.me have been working on tools to give people more control over their own data and how it's shared. They're not looking to stop all data sharing, but rather put it back under the control of the individual users, rather than companies in the middle. While this may make some companies nervous, it shouldn't. A company that is actually providing value and is properly transparent shouldn't have to worry about such things. 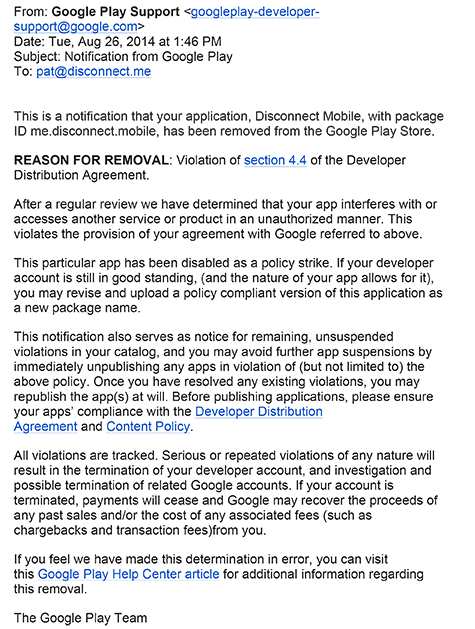 So it's quite disappointing that Google has chosen to pull Disconnect.me's new app from the Android store based only on a very vague and broad "prohibition" in its terms of service, saying that you can't offer an app that "interferes with" other services. The email Google sent doesn't provide many details, other than saying that the Disconnect.me app "interferes with or accesses another service or product in an unauthorized manner." But our mobile product (like our Desktop product) is not an adblocker. Instead Disconnect focuses on protecting people from invisible tracking and sources of malware, and all too often these threats come in the form of advertising. In fact, some of the most privacy invasive data collection online happens through ads, which see you even if you don’t see or interact with them. And worse, ad networks (including Google) are increasingly being used by “advertisers” to spread malware. This increasingly popular tactic, called malvertising, is currently being investigated by the US Senate, and Disconnect Mobile is the first app to directly address it. The fact is, we are not opposed to advertising and think advertising plays a critical role in the Internet economy. But we are 100% opposed to advertising that invisibly tracks people and compromises their security. In short, Disconnect.me is working to block evil activities. You'd think that the company with the whole "don't be evil" slogan would appreciate an app that tries to protect users from evil. But, as was the case when we got threatened with being cut off from ad revenue, it appears this is yet another case where you have a very large company that has put in place "by the book processes" that lead to a lack of common sense being employed. Instead you get checkmarks and bad end results. This all goes back to one of my biggest complaints about Google, going back years, that it continues to be the big white monolith when dealing with all sorts of users, customers and partners. Programs like AdSense and the Android Play Store are massive, and there are, certainly, those who look to abuse those systems. And so it's no surprise that the company has put in place policies to help try to weed out those abuses -- even leading to some false positives. The problem is that the company all too frequently doesn't have any real second level of review where common sense comes back into play. Disconnect.me is appealing the decision and seeing if it can get Google to reverse its position -- and hopefully that happens. It still seems to me that this is one of Google's most glaring problems as it has grown, and it's shown little sign of improving on this front to date. I know that Google is especially sensitive to antitrust concerns being leveled against it, and I'm honestly confused why the company doesn't view this as a potential concern on that front. When it has the ability to cut people off from areas where it has massive control (including the Android market and the advertising market), it's only asking for trouble from those where it makes the wrong call. Recently, the American Assembly released Copy Culture In The US & Germany, a report based on an extensive survey about attitudes and practices surrounding media consumption and piracy in the two countries. (Disclosure: We supplied the design and layout work for the report.) It contains lots of interesting facts, and some very surprising ones—such as more support for content blocking than one would expect given the public reaction to things like SOPA and ACTA. We've already discussed one of the important broad takeaways—even more evidence that pirates buy more media—but amidst the smaller details in the survey are several other points that are worthy of a closer look. Opposition to disconnection also rises sharply with income (which in turn correlates with the propensity to buy media). 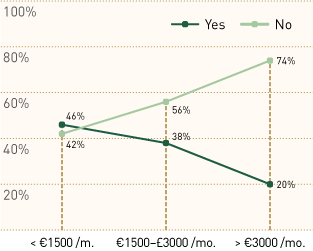 Among penalty supporters who make more than €3000/month, 20% support disconnection; 74% oppose it. As the report notes, this could have something to do with the fact that higher earners also buy more media—though that still doesn't make it entirely clear why this should be the case. Even more curiously, high-earners were more likely to support content blocking by ISPs, search engines and social networks, but still more likely to oppose internet monitoring. It seems like there's a lot of room for conjecture as to what these patterns mean, if anything, so I'm throwing this open to our readers, especially those in Germany: what social, economic or other factors that correlate with income might explain this trend? You may remember last fall's numbers concerning how many first, second and third strikes Hadopi, the French agency in charge of kicking people off the internet for possible copyright infringement, was sending out. Now come reports that France is finally moving beyond just the strikes, and has passed along info on those accused (not convicted) of infringement to "prosecutors" for the next stage, which could result in them losing internet access. The report also notes that Nicolas Sarkozy, who was the original champion of three strikes plans, is already looking to expand the law to go after cyberlockers rather than just peer-to-peer, as is the case with the current Hadopi plan, apparently. I'm sure, in an effort to support such a move, politicians will push the misleading claim that Hadopi has actually worked, even if the actual data suggests what really worked was wider availability of legitimate services and tools. Customer: I want to reconnect my internet service. They said I got 3 DMCA letters and they said that by law I had to be disconnected. Is that true? Suddenlink rep: Yes, your internet was disconnected due to DMCA. When the internet is disconnected due to DMCA, it can not be reconnected for a minimum of 6 months. Customer: The DMCA makes that requirement? Customer: So you're stating, for the record, that by law, the DMCA law, that you have to disconnect users for receiving 3 DMCA letters? Suddenlink rep: You have no choice in the matter. Suddenlink rep: It is the DMCA policy that it can not be reconnected for 6 months. Suddenlink rep: It may be the DMCA policy or it may be the way we go about following the DMCA guidelines. Customer: The law states that? Suddenlink rep: Once the 3rd offense occurs, it can not be reconnected for 6 months. Suddenlink Rep: The information I have on the DMCA states: This law was enacted in 1998 to protect against illegal downloading of copyrighted material like movies, music, etc. As an Internet Service Provider (ISP), Suddenlink , and other ISPs, must implement a policy of terminating internet service of customers who repeatedly share copyrighted files. This is, of course, not true. The DMCA has no requirement that ISPs disconnect people after three accusations (not convictions) -- and it especially doesn't say that ISPs don't need to offer a refund when they do this. For all the fighting by the record labels trying to get a three strikes policy into law and complaining about the DMCA, perhaps it makes them happy to know that some ISPs are simply pretending the DMCA is a three strikes policy. Of course, customers may think otherwise, and may prefer to find an ISP that actually believes in due process and actually supports its users against unsubstantiated accusations of file sharing. While the EU Parliament has warned about the civil rights violation represented by any "three strikes" laws that would kick file sharers offline after three accusations (not convictions) of file sharing, France has continued to move forward with just such a law. Michael Scott points us to the news that France is close to finalizing its legislation on the topic, which has one major difference from other "three strikes" laws: rather than the ISPs acting as the copyright police, it will be a new French government agency that will do the dirty work. Yes, the law will propose an entirely new French bureaucracy, which would act as the intermediary between copyright holders and ISPs. If a copyright holder believes that someone is infringing on copyrights, it would send the info to the agency, who would investigate, get info from the ISP, and (if the agency believed infringement occurred) send out a threat letter to the individuals responsible. That agency would also have the ability to demand that an ISP cut a user off for repeat offenses. What's never explained is why any of this extra-judicial process is needed. Isn't there already a court of law in France that would allow a copyright holder to accuse an alleged infringer in court, where that alleged infringer could mount a defense to show that he or she was not guilty of infringement? Furthermore, it's unclear why the government should be involved at all -- especially with the growing evidence out there that the "problem" of copyright infringement is simply a business model issue. Those who have put in place smart business models don't seem to have any problems at all with infringement. So why not just point those who are clinging to an obsolete business model to examples of those who have succeeded by embracing file sharing, and tell them it's time to adapt? Apparently the UK ISP Karoo has changed its terms of service to note that it will disconnect customers if it discovers they have an open WiFi access point. This isn't all that surprising, though it isn't particularly reasonable. When WiFi first came on the scene a few years back, there were a few ISPs that claimed the same thing -- though their reasoning was that they were afraid people with open WiFi were illegally "sharing" the connection with neighbors. Hell, there were some ISPs that wanted to charge you per computer you connected to a broadband connection. However, as WiFi became common, most ISPs dropped those restrictions, so it is interesting to see them coming back. The reason for cutting off open WiFi users is unclear -- and it's likely that Karoo will claim security reasons -- but TorrentFreak wonders if it has anything to do with the entertainment industry, which is sick of losing cases after people point out that, thanks to an open WiFi, it could be anyone that had used the connection. Either way, it seems like a good reason to find a new ISP, if your ISP is going to get involved in how you set up your local network. Despite the fact that the EU Parliament rejected the concept of a "three strikes" law for kicking people off the internet, and warned member countries that such laws interfered with civil rights and privacy rights of individuals, France is moving forward with such a law. The EU Parliament specifically had called on France to reconsider such a law, but the French Senate has approved the law by an overwhelming majority, 297 to 15. The law still needs approval from the lower house of Parliament as well, but it's disappointing that any government body would approve such a law after it's been shown to be both unnecessary and destructive.